The introduction explores how recent developments in the shift towards a global and transnational history provide the historiographical framework of the volume. 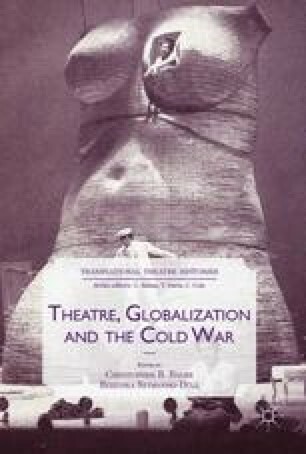 It discusses under what conditions, criteria and concepts one can conceptualize theatre history in the context of the Cold War as a transnational or even global phenomenon. The point of departure is the curious paradox that the most significant geopolitical development of the postwar period—the Cold War—has brought forth so little research in terms of the role played in that global conflict by theatrical culture. This dearth of scholarly interest is especially remarkable in light of the fact that Cold War confrontation and competition, although primarily military and ideological, always had a pronounced cultural component. The volume examines Cold War theatrical tensions by presenting a range of current scholarship on the topic from scholars from a dozen countries. They represent in turn a variety of perspectives, methodologies and theatrical genres including not only the usual suspects, Bertolt Brecht, Jerzy Grotowski and Peter Brook, but also documentary theatre, opera production and Polish folk-dancing.